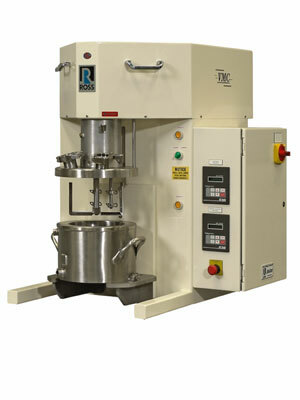 Ross offers customizable Multi-Shaft Mixers for processing solid-liquid dispersions, solutions and emulsions over a wide range of viscosities. These devices can be designed to impart high levels of shear for powder wet-out and particle size reduction using a high speed sawtooth disperser blade and/or a rotor/stator assembly. For viscous, low shear/high flow applications, a combination of bow-tie blades and an anchor agitator delivers rapid turnover as well as superior heat transfer. Shown is a Ross Model VMC-1 VersaMix Multi-Shaft Mixer which has a working capacity of approximately 0.50 – 0.75 gallon (full holding capacity of 1 gallon) and capable of vacuum operation up to 29.5”Hg. An air/oil hydraulic lift raises the mix can to the agitators and vacuum cover. Explosion-proof limit switches prevent operation of the drives when the vessel is removed or not in the mixing position. Driven by a 0.5 HP inverter-duty motor, the two-wing anchor agitator includes Teflon scrapers that contact the jacketed vessel’s sidewall and bottom surfaces. The bow-tie mixer shafts are each driven by a 1 HP motor and feature easily removable blades. All three agitators can be engaged in any combination and at any RPM within their respective speed ranges, allowing for a very versatile mixing system. Single mechanical seals are located at the entry points of the agitator shafts into the mix zone. Secondary Teflon lip seals are also provided. Ross Multi-Shaft Mixers are available in standard or sanitary configurations from 1 to 4,000 gallons capacity. An extensive range of agitator combinations, horsepower selections and optional features are available to tailor suit any mixer for a particular processing requirement.